To many of ours awe a great majority of the beautiful landing pages with perfect aesthetic aspects fails terribly as far as conversion is concerned. This is surprising because often we consider design as the most important aspect to grab user attention and convert their presence into further convertible business leads. But that actually does not happen. Question is why this does not happen. It happens simply because in achieving aesthetic perfection we stress too much on design and least on customers and this ultimately lead us to a situation where conversion is sacrificed for design. If this is just one gross mistake there are obviously others. Let us have a look at the 4 most idiotic landing page mistakes that you cannot afford. There are too many landing pages optimized in every aspect including the engaging content and nice eye grabbing design but many of them lack the most crucial thing which is nothing but an image or visible depiction of their product in question. For instance you are offering an app to represent your pizza delivery business and in the entire landing page there is not a single image or graphics that depict your business visually. Just think can it make an impression as better as a landing page offering an appropriate image? Without seeing your product or service in question how the visitors are going to react positively. Are you expecting them to read it on your description and on the basis of that taking a step forward by filling up the form? You are actually asking too much from them. Offer a clear image or visual graphic of your product that can grab attention just at the first glance. If applicable punch a bit of activity with your product image. That makes a quicker impression. This actually illustrates the useful side of your product or service. How funny it looks when one just takes it granted that the visitors know about their business. Unless you are a Coca Cola or a Google, visitors simply know nothing about you and it is your responsibility to educate your visitors regarding your product, brand or what you actually do. ?do not assume that the visitor knows about your business, just make them informed first through the landing page text. Telling the visitors through the headline to register without explaining what he is to register for is a blunder and will hardly yield any result. Similarly, if the Call to Action button tells the visitor to click for free tickets, it is again an idiotic trick because the visitor has no idea what the tickets are for. Always treat visitors as completely ignorant about your business and what you are up to. Always explain your business and activities in clear terms and then explain how you are better than the competition. Always explain how your product or services can add value to the lives of your prospects. The opening headline itself should be suggestive of your business and what you are going to offer. A strong, focused and direct headline with crisp description of the business will be selling your landing page instantly and convert visitors into leads. Users now mostly read headlines and few lines here and there besides taking a good look at the visual content. This has been the mainstay in the user behavior across digital platforms and especially on mobile devices which accounts for more than half of internet users reading text in dense paragraphs is a rare thing to expect. Moreover, for most visitors landing page is a distraction from their main purpose of visiting the website and so reading too much text is least probable. So over explaining your purpose or business or product with too much text will actually make users feel bored and they would like to skip the landing page altogether. It takes real effort to read a few paragraphs and nobody would like to put so much energy on a landing page. Just trim your content to very essential key points and use visual depiction as much as possible replacing text. 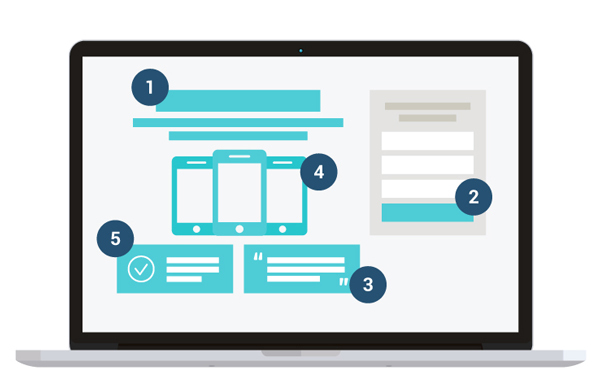 A few benefit explaining lines that perfectly complements your explained agenda on the headline will make the landing page copy smart and effective. If your business typically has diverse customer personalities marketing to all of them will surely be hard enough. How a business can design a landing page that appeals to diverse groups of people without failing to address the core ideal customers and potential visitors? This remained as the single most important concern for these businesses as far as effectiveness of landing page is concerned. To address this problem many businesses offer a typical click through page whereupon by choosing an option you can land over the actual landing page. But this approach makes it more problematic. Without knowing a single thing about the business or what the landing page is all about you have a few options to choose from. Until you get on the landing page you do not know a single thing about the business but in spite of not knowing anything you have to choose one option on the click through page. Hardly a visitor can be motivated to make a choice until he sees the landing page explaining about the business. When your business is addressing diverse persona you can make use of separate ad campaigns addressed to each segment and from the respective campaigns drive traffic to separate landing pages. Do not let users select the options. Rather drive traffic to separate customized landing pages through targeted ad and pay per click campaigns. The above mentioned mistakes in landing pages show that only aesthetic elements and layout just cannot achieve conversion unless you optimize them with more visual, readable, approachable and responsive content explaining your business and products in clear terms. Chirag leuva is the CEO of Yudiz Solutions, an mobile app design and development company; where he works to bring client ideas to reality. He enjoys pushing the limits of user interaction and finding ways to create awesome reusable components within a mobile environment. Nice tips how to design an effective landing page that is more visual appealing and readable that explain our business and products clearly with a call to action in the landing page.